everything old has passed away; see, everything has become new!" There's much to be written regarding the gifts of the ELCA Churchwide Assembly which met in Pittsburgh last week. 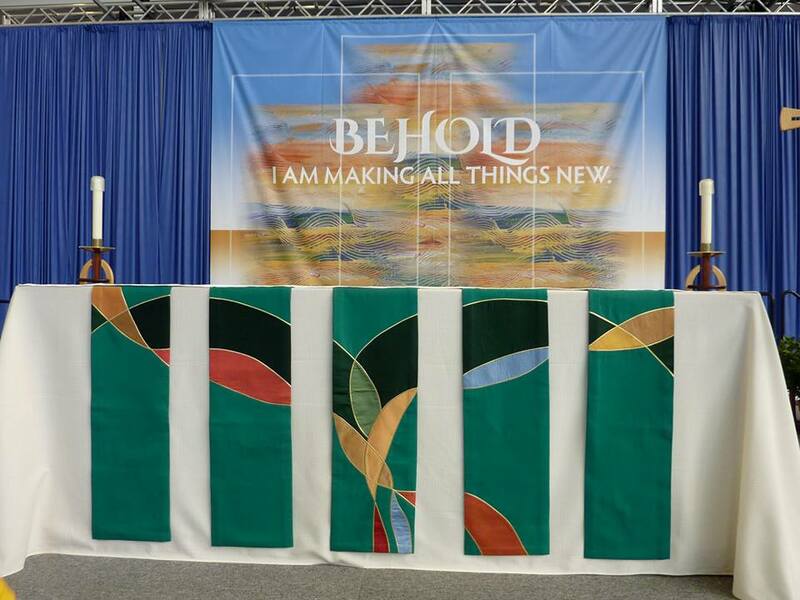 As a voting member of the Central States Synod (Kansas and Missouri) I spent the week awe-struck by the energy, faithfulness, peacefulness, and hope witnessed at the assembly. Hope for what God is doing in the world right now. Hope for what will be that continues to be unknown and yet unnamed. If I could sit down with you, I'd share with you about the almost 1,000 people from all walks of life and all across the country gathering for worship daily, lifting voices in song and prayer, sitting in the silence, seeing and hearing the diversity of all God's people called to preach and preside. I'd also share with you the beauty of celebrating in song. Four-part harmony among Lutherans is as close as you get to the heavenly choirs of angels. And the dancing - a congo line with bishops, pastors, youth, the young and old, moving and shaking and singing, "Come, Come, Come Holy Spirit, Come!" And of course, I couldn't pass up the opportunity to tell you about the cookies! Oh, the cookies! 440 dozen a day to be precise. The Pennsylvania women of the ELCA know a thing or two about hospitality, and the need for sugar after a long day of working. I'd also share passionately my pride in the ELCA for making a statement about criminal justice, in hearing the cries of the oppressed and offering our voices into the conversation and inviting our congregations into places of learning and engagement with those in the criminal justice system. I'd invite you to join the ELCA in moving forward with conversations on ministering to same-gender couples and families. I'd tell you of the wonderful resource the ELCA published this year, "The Prayerbook for the Armed Services" and encourage you to share the book with military men and women and their families. And then to join in prayer for those who serve our country. I'd invite you to give - give to World Hunger, Lutheran Disaster Response, Global Missions, and the Malaria Campaign, just to name a few of the amazing demonstrations of the church at work in the world. We listened to a man from Malaysia who learned of the love of Jesus from an ELCA missionary. I'd tell you about the young adults who shared their voice and who raised their voices in support of youth and young adult ministries. One cannot forget the election of Bishop Elizabeth Eaton and the gratitude and graciousness displayed between Bishop Hanson and Bishop Eaton; two very fine leaders whose commitment to the Gospel of Jesus Christ leads this church into the heart of a world in need. I'd also share that this assembly was the first to have a representative of a non-Abrahamic faith invited to share a welcome. A Sikh man eloquently spoke of the hope he felt after the shooting in Oak Creek, Wisconsin and that the first group to reach out to the Sikh community was the ELCA with a letter from Bishop Hanson. I'd tell you that God is indeed doing a new thing among us and that YOU are a part of that new thing. Perhaps most importantly, I'd tell you about a line. Walking in line to receive the gifts of God in bread and wine. One morning as I walked towards the front to receive communion during the daily worship, I stood behind a father with his 7 month-old daughter and a family with their toddler son. I'd tell you that in those two children and in their families, I saw the reason why we gathered this week. I saw in that young baby girl and that toddler boy that the church will be here for them. The church is here for them now to receive God's free gifts and to know that they are loved. And the church will be there for them to share their God-given gifts and to provide them with a community that rolls up their sleeves, stands on the side of justice and peace, hears the cries of the oppressed, and believes that God is making all things new. Come, Come, Come Holy Spirit, Come.